This year, in Malaysia already have 2 times especially at Kuala Lumpur as know as Korea Festival or Korea Fair for promote South Korea..The best part are this event have related with K-Pop. Before this, Korea Tourism Organization Kuala Lumpur make event Korea Festival at Pavillion Kuala Lumpur and their invite Korean artist Big Star to make performance. 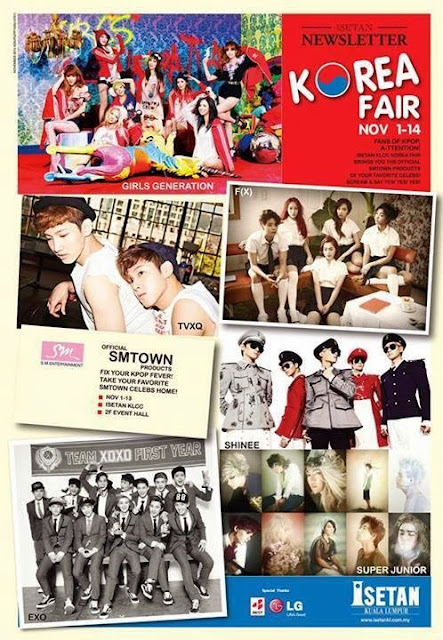 Now, second event Korea Fair at ISetan KLCC, Twin Tower Kuala Lumpur Mall, start on 1st November until 14th November 2013. This times, SM Town fans can look and buy the official merchandise from SM Entertainment at ISetan 2nd Floor Event Mall, start on 1st November until 13th November 2013.